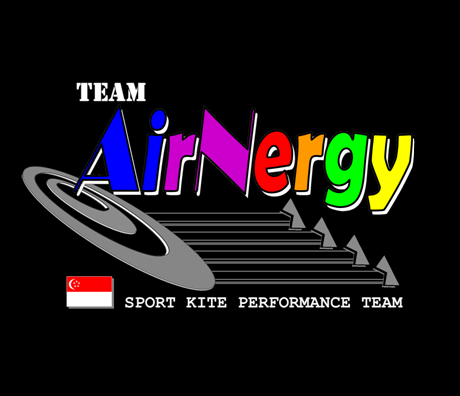 Formed in Dec 2010, Team AirNergy is a sport kite performance team from Singapore. We fly quad-line kites from Revolution USA (Revs for short) predominantly, as well as single and dual-line sport kites. A quad-line kite has left and right forward/reverse controls that enables a wide range of movements from forward fly, reverse, hovers in any orientation as well as any combination of movements. Kite ballet is the flying of dual or quad-line kites with a set of synchronized movements to music. For the uninitiated, this is akin to a dance or ballet performance where the the “dancers” on the stage are now the kites in the sky. It is the kites, and not us that are doing the dancing to the music! :Þ. Check out Our Videos page! We have performed at festivals in various countries Singapore, France, Taiwan, Malaysia, Thailand and Vietnam. Members of the team have also attended festivals in other parts of the world like Houlgate in France and Berkeley Kite Festival in USA. We are always looking for opportunities to attend different festivals so as to bring our performances to the local public. Please feel free to contact us if you’d think there is an opportunity to attend a festival somewhere. The current team comprises of 4 members from left to right, in positions 1-4: Chua Lin (blue kite), Peter Teo (purple kite), Zulkifli Mohamed (Red kite) and Adenan Haron (Lime kite). You can find out more about each of us over here. As of 2016, we have a stable of 4 ballet routines, each with a different purpose/team. We are currently working on more routines to expand our repertoire. There are also other routines that we do that are free-forming and flown by feel. “Faithfully”– Journey: This is our routine primarily for light wind conditions. “New World”– A.Dovrak: This is our routine for high wind conditions. “Ip-Man”– Ip-Man soundtrack: A standard wind routine with a touch of Chinese kungfu influence. “Sway”– Michael Buble: Another standard/high wind routine with a dancing/tapping feel. “Stairway to Earth” – Led Zeppelin/Michael Jackson mix: This is one for impromptu megafly with other Rev fliers and one of our free-form pieces. Have fun flying and keep up the spirit and good work. Take care and hope to meet you all one day.